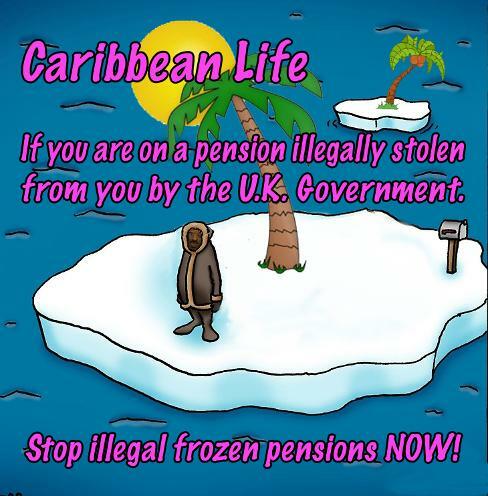 The British Caribbean Pensioners Association (BCPA) is an organisation based in the Caribbean representing frozen British pensioners. Who is entitled to a British Pension? Every person who worked or works in the U.K. (citizen or not) makes payment, by law, to the U.K. universal pension fund by weekly National Insurance (N.I.) remittances. Anyone who has contributed for ten years or more is entitled to a pension and, dependent upon when a person retired, entitlement to a full pension is anywhere between 30 and 44 years of contribution, currently 35 years. For many pensioners, shortfalls to the minimum number of years may possibly be made up by the payment of additional contributions. 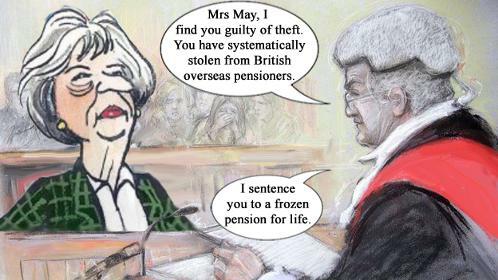 What is a frozen British Pensioner? A 'frozen' pensioner is a person who does not get the annual increase in pension awarded each year by a vote in the U.K. Parliament. How many pensioners are frozen? There are 540,000 pensionable age men and women entitled to a U.K. pension but living in countries where their pension is frozen. The frozen pensioners represent about 4% of all British pensioners and most of them are quite elderly. Many of them, widowed, have moved to join their families, some have remained in countries where they were sent by their British employers and others returned to countries where they were born. Where do the frozen pensioners live? It is easier to say where they do not live. Of the 200 countries in the world, 150 have frozen pensioners including almost all the Commonwealth countries with the majority of pensioners living in Australia and Canada, the very countries the U.K. calls upon in times of crisis. To illustrate the injustice, if you live in the USA, your pension is increased each year along with U.K. pensioners but not in adjacent Canada. Equally preposterous is that British pensioners get their pensions increased if they live in the Philippines, Israel, Mauritius and a variety of other oddly located countries. Probably most ridiculous are the Falkland Islands where many British lives were lost and much money spent to keep the islands British yet British pensioners living there have their pensions frozen although, similar Gibraltar, does not. A full list of frozen and non-frozen countries appears on this website. If you live in Barbados or Jamaica your pension is increased each year but not if you live in Antigua & Barbuda, the Bahamas, Cuba, Dominica, Dominican Republic, Grenada, Haiti, Saint Kitts & Nevis, Saint Lucia, Saint Vincent & the Grenadines or Trinidad & Tobago, many former British colonies. If you live in Bermuda, Guadeloupe, Martinique, Netherlands Antilles, Puerto Rico or St. Maarten your pension is up-rated annually but not in the British Overseas territories of Anguilla, British Virgin Islands, Cayman Islands, Montserrat and Turks & Caicos Islands. How fair is that? How many pensioners are not frozen? There are 12.95 million U.K. pensioners of which 1.25 million live overseas. Around 470,000 live in the EU and 220,000 live in countries with which the U.K. has a reciprocal agreement. All those 690,000 have their pensions up-rated each year in line with U.K. pensioners. Why them and not us? How has this injustice come about? 1948 - The universal British State Pension was introduced at £1.6 shillings (£1.30) per week. It was a compulsory contribution system for all persons of employment age. The payment of a pension was dependent upon a minimum of ten years contributions with an upward sliding scale payment to a maximum benefit after, initially, 44 years for a man and 39 for a woman but subsequently altered several times. 1973 - U.K. joins the EU and enters into reciprocal agreements with the EU countries where previous reciprocal agreements had not existed, the EU then being only 8 countries but now 27. Fifty two countries or territories have reciprocal agreements with the U.K. including all the EU countries, 147 countries or territories do not. 1981 - U.K. Government determined not to enter into any further reciprocal agreements with foreign governments preventing pensioners in around 140 countries worldwide (the number of countries was fewer than today), mainly Commonwealth countries, from obtaining annual pension increases just because where they live. Each year Parliament votes for a pension increase and that vote includes those pensions which are frozen. But, immediately after the pension increase is approved, another vote is taken to exclude pensioners living in countries where there is no reciprocal agreement. It is a deliberate act of exclusion except that most MPs do not realise they are voting to unjustly freeze pensions. We feel it is time for this annual dishonourable and dishonest act to be discontinued. Recently, the U.K. Government has promised to continue to up-rate pensions in the EU after Brexit despite the fact that there is no reciprocal agreement with more than 20 EU countries. We agree they should be up-rated but, if it's fair for them why is it not fair for us? The Government claims it is too expensive. So depriving the elderly of their rightful pensions is nothing but a cynical money saving exercise by the Government but, even saying it is too expensive is a lie. Yes, it will cost an annual £0.5 billion but that is only 0.7% of the annual pensions budget which, in any case, is massively in surplus. Plus, the second Iraq war cost the U.K. Government £39 billion and they found that money easily enough. £39 billion would have paid for more than 65 years of frozen pension up-rating. Write to the MP where you last lived in the U.K. and complain about the injustice of frozen pensions. Why should you receive less than other pensioners when you have paid just the same as them? The more letters they get, the more notice they will take. Don't know who your MP is? Click here for a list of U.K. MPs and their constituencies. Write to the Prime Minister of your country and if you have any contact with him/her or any other of your Parliamentary representative, write to them, talk to them, make sure they understand what the U.K. Government is doing to your pension. Write to your local paper and, if you have a story to tell, write to us and the U.K. press. Tell your friends and get them to tell their friends how dishonest and dishonourable the U.K. Government is being by freezing your pension when you have paid the same as everyone else. Spread the word. Join the British Caribbean Pensioners Association. At the moment we are not charging any fees but we would like to donate to the International Consortium of British Pensioners (ICBP) which we cannot do without income so fees may come in the future. To begin with, we can ensure you are receiving the pension to which you are entitled. We will also be fighting to get your pension up-rated along with pensioners in the U.K., the EU, the US and the other places in the world where pensions are annually up-rated. We will keep you advised of any changes or parts of the law with which you may not be familiar, for example, did you know that if you go on holiday to a country where pensions are up-rated, you can apply to have your pension increased for the duration of your stay? We consult with other British pensioner organisations who are fighting the same cause. Each year a delegation is sent to London to meet with MPs, members of the House of Lords and the press and in April 2018 we sent a representative to the Commonwealth Heads of Government Meeting in London to raise the subject in the Peoples' Forum. In October/November, representatives from the Caribbean, Australia and Canada again met with U.K. MPs and Members of the House of Lords but this time we brought a 93 with us year old decorated war veteran from Canada and an 80 year old Windrush immigrant (who had returned home to Antigua). Our war veteran was lapped up by the press making both the BBC News and the ITN News plus other radio and TV programmes. The printed media also published several stories. Whilst in London, we met with three firms of lawyers to discuss legal action but put any action on hold until after Brexit. The highlight of our trip was a visit to 10 Downing Street to present 216,660 signature petition. We had hoped to meet with Theresa May but, instead, met with one of her senior advisors. We are hopeful of a meeting with the Prime Minister one Brexit is sorted.and national newspapers to press our case. We are in constant contact with other pensioner organisations and, through the ICBP, a media company is employed in the U.K. to promote a change in the law and we write regularly to MPs and the U.K. media, both local and national. You should do the same andEmbarrass the Government.